Anna Maltz’s marlisle technique is one of the coolest things I’ve seen in a while. 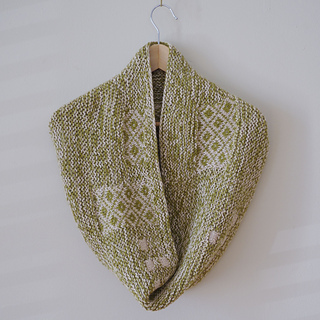 It gives a knitter the ability to work areas of color with more spacing stitches than stranded knitting easily allows, and without the hassle of bobbins that intarsia requires. Here, the technique allows for an organic arrangement of ‘patches’ on a speckled background, worked quickly and enjoyably in the round. Inspired by Japanese boro textiles, the patches set out to mimic printed woven cottons - beautiful scraps patchworked over a plainer, marled background. Using snuggly alpaca yarn held double, however, gives you a cowl with more bounce and cosiness than woven cotton fabric ever could. 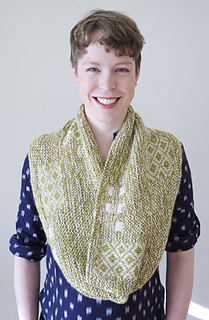 There’s a little bit of careful shaping on one edge of the cowl, to ensure it drapes elegantly when worn. One size for adults or teens: 46”/ 117 cm circumference by 10”/ 25.5 cm wide. 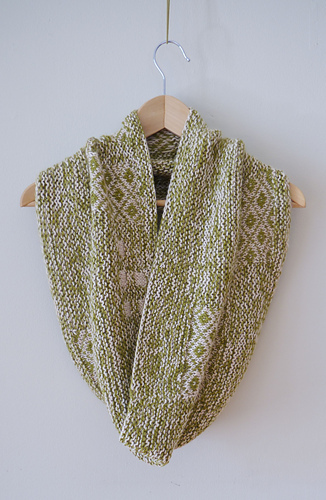 Sample shown in Scaapi Kokon Worsted (100% baby alpaca, 218 yards/ 200 m per 100 g), in Stone and Cactus. US 8 (5 mm) 32”/ 80 cm circular needle, or size needed to obtain gauge. Written instructions and a detailed schematic are provided for knitting the cowl, so you can work from your preferred format. Charts (only) are provided for working colorwork patterns. Intermediate. 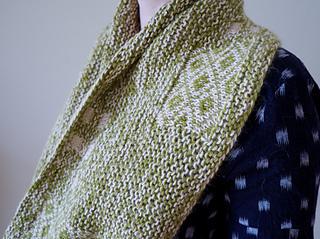 The ‘marl isle’ technique is not difficult, but may not be the best choice for a first colorwork project, as a little care must be taken to keep the tension consistent.